Haq's Musings: Can US Afghan War Remake Pakistan? 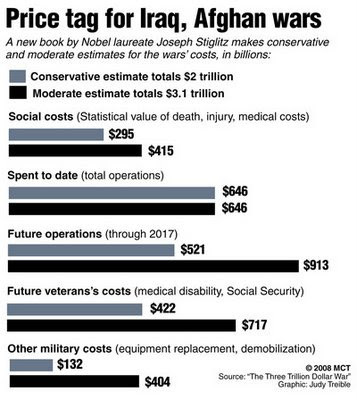 The $663 billion US defense budget for 2010 announced by Defense Secretary Robert Gates emphasizes higher spending on counterinsurgency weapon systems, and cuts back on expensive conventional weapon systems. For example, there is a huge increase in the budget for predator class armed drones, helicopter gunships, surveillance, cyber warfare and special (commando) operations. At the same time, it envisions deep cuts in spending on the expensive F22 Raptor stealth fighter, large navy ships and anti-missile defense shield. 1. Intelligence, surveillance, reconnaissance (ISR): budget to be increased by 2 billion dollars. 2. Predator unmanned aerial vehicles (UAV): Fielding and sustaining 50 Predator-class UAVs. 3. Army aviation forces: recruiting and training of additional Army helicopter crews and increase the budget by 500 million dollars. 4. Special forces: increasing special operation personnel by more than 2,800 and buying more aircraft for the special forces. 5. F-35 fighters: Gates plans to buy more F-35 fighters in fiscal year 2010, raising the F-35 budget from 6.8 billion U.S. dollars to 11.2 billion dollars. The proposal is to double the number of F-35 Joint Strike Fighters the Pentagon buys next year -- to 30 from 14 in 2009. The F-35 is a cheaper, more multipurpose plane but it can't begin to compete with the F-22 as a fighter jet. 6. Littoral Combat Ships (LCS): Gates proposes to increase the purchase of LCS, seen as crucial to counterinsurgency operations in coastal regions and to improve inter-theater lift capacity. 7. F/A-18 fighter jets: Gates plans to buy 31 more F/A-18 fighter jets in fiscal year 2010. 8. Joint High Speed Vessel (JHSV): increasing the charter of Joint High Speed Vessel (JHSV) ships from two to four until the Pentagon's own production program begins deliveries in 2011. 1. F-22 Raptor fighter jets: Gates said the Defense Department would complete its contract for 183 F-22 fighters and add four more, bringing the total to 187, before stopping the purchases. 2. VH-71 presidential helicopters: Gates said he plans to terminate the program, which had nearly doubled in cost to over US $ 13 billion and was six years behind schedule. 3. Transformation Satellite Communication System: Gates plans to cancel the program and buy two more Advanced Extremely High Frequency satellites instead. 4. CG-X next generation cruiser: Gates plans to scrap the program for now, which was initially planned to be based on the DDG-1000 design. 5. Aircraft carriers: Gates also envisions to reduce the number of aircraft carriers from 11 to 10 after 2040. 6. Future Combat Systems (FCS): Gates will restructure the Army's modernization program and cut costs. 7. Missile defense: Gates will cut annual funding for missile defense by $1.4 billion. The losers include the Airborne Laser, designed to shoot down ballistic missiles in the boost phase, and additional interceptors planned for the ground-based system in Alaska. Combat Search and Rescue X (CSAR-X) helicopter program: Gates plans to cancel the 15-billion-dollar program to build new search and rescue helicopters. 8. Amphibious ship and sea-basing programs: Programs such as the 11th Landing Platform Dock (LPD) ship and the Mobile Landing Platform (MLP) SHIP will be delayed. Gates characterized the budget shift as tailored to face the challenges of America at war with a host of players, many of them stateless and highly mobile, as opposed to the Cold War approach that long dominated the Pentagon's view of planning. Gates acknowledged that his decisions would invite a lot of strong reaction. "There's no question that a lot of these decisions will be controversial," he said at a press conference on Monday where he outlined his budget proposal. "My hope is that, as we have tried to do here in this building (Pentagon), the members of Congress will rise above parochial interests and consider what is in the best interest of the nation as a whole." Going by the history of defense budget process, lawmakers on Capitol Hill are more interested in funneling money to their home states than in spending dollars most effectively. Democrats and Republicans both help themselves and their constituents' short-term interests while criticizing the executive branch for failing to make tough choices. The announced US defense budget for 2010 is nearly $700 billion (more than half of the trillion dollars spent on defense by the entire world) while the total aid for the developing countries from all the rich countries is only about $60 billion, including about $20 billion from the United States, accounting for less than 1% of US annual budget. 3. 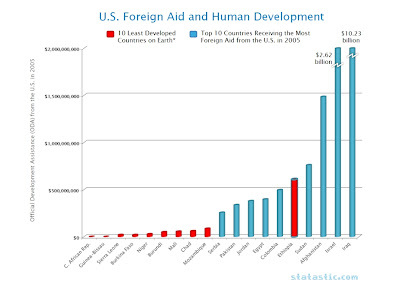 Israel is the richest country to receive U.S. assistance ($77 per Israeli compared to $3 per person in poor countries). 4. Even after the planned tripling of the US aid to Pakistan, it still amounts to less than $8 per Pakistani. The planned $1.5 billion annual aid to Pakistan will be just over 1 percent of the $130 billion US budget for military operations in Afghanistan and Iraq. As Professor Anatol Lieven of London's King's College recently put it, "the stabilization and development of this country (Pakistan) is not merely an aspect of the war in Afghanistan, but a vital US interest in itself. Indeed, Pakistan in the long term is far more important than Afghanistan. The second is that changing Pakistani opinions will mean changing Pakistani society, and that is a project that will require massive, sustained and consistent aid over a generation." The professor adds, "Eight dollars per head is not going to transform anything much in the country. More over, the US statement emphasizes that the aid will be made conditional on Pakistan’s help to the US against the Taliban. This is a recipe for constant hold-ups, congressional blockages and the wrecking of any consistent, long-term programs." The process of piling on all sorts of conditions by various interest groups and Indian lobbyists in Washington has already started as the aid to Pakistan bill comes up for debate in US Congress. According to Pakistan's Dawn newspaper, the first major condition for aid requires Pakistan to undertake not to support any person or group involved in activities meant to hurt India and to allow US investigators access to individuals suspected of engaging in nuclear proliferation if it wants to qualify for a threefold increase in US economic assistance. This is probably just one of many conditions that Pakistanis will see as an insult to and assault on the nation's sovereignty. By adding more American UAVs and US troop reinforcements in Afghanistan, the commitment of significantly more money for greater firepower will remake neither Afghanistan nor Pakistan. On the contrary, it is certain to have major long-term negative repercussions for Afghanistan, Pakistan and the American interests in the region. At the very least, it is natural to expect more fighting and mounting American and civilian casualties during this year and the next few years, unless saner minds prevail and US changes course in favor of more political dialog and much greater use of soft power in the region. As the people so the country. Short sightedness is the disease of pakistan. For the last 60 years, it had wasted its precious economic resource in creating hatred toward india rather than in creating infrastructure for growth. In the short run the taliban could pay 150usd per month for the soliders. This is possible only till they are not the ruler and they can plunder the government and people. Pakistan / tabila one majore mistake is that they are not understanding that they donot have oil like iran or iraq to sustain. Presuming in six months time, taliban is the ruler where will they get funds to pay. Then the starting of another afghanistan. Sow poverty, reap poverty and distribute poverty. To add to its troubel there will be international embargo from their earlier friend USA. Destiny is all powerfull. who knows what is in store as no body would have ever thought that american can be in economic chaos few years back . So used to handouts, PK is still hoping to get some money from US and sink even deeper in the hole... If the ruling class sets up its capital in Bannu, Dir, Swat or any place in Baluchistan, only then will they understand the gravity of the situation. There is no concern from anyside. Politicians wants to make money in the name of democracy. USA wants to fiddle around afghan using pakistan for its ego trip. Army wants a retribution with india for bangladesh. People are fed and want immediate justice which is being handed over by taliban. What is a country ? A country is people and only people. If the people are not open to see their own mistakes and blame others nothing is going to happen as the inherent weakness will not go out. Intellectuals including this site wants to project to the whole world that all is fine with pakistan and the problem is only in india. I find comments that its is usa/israel and india which is fiddling with pakistan. Probably usa / israel might be right but not india as it has its own set of problems and god grace the past history was that the india was focusing its energy more on developement rather than sowing seeds of hatred for anybody. Immediately there will be quoting of varun / bjp / gujarat / orissa. Pls see this as a perentage to the overall india. Pls see the influence of fundamentalist in pakistan to the over all area. India is not looking out for any aid. Rather america is looking out for india as a market to dump its stupid nuclear reactors for which all the politicans of india has already been sold out. When usa is not doing any nuclear reactor after 1970 why to india ???????????????? Till such time that has to happen USA will love india. "We are all Taliban," one young man said -- meaning that people in his region support the cause, if not the terrorist tactics. He explained that the insurgency is spreading in Pakistan, not because of proselytizing by leaders such as Baitullah Mehsud but because of popular anger. For every militant killed by a U.S. Predator drone, he says, 10 more will join the insurgent cause. I think saleem could be a good sample which you have not seen on your modern muslim youth. I agree with the anonymous who said "Saleem could be a good example of modern muslim youth"
While there are good number of muslims who understand the gravity of crisis islam in general is in and pakistan in particular,Saleem represents a excellent example of why taliban is growing and only growing in Pakistan.You do not need any enemy to destroy our nation-here we have enough saleems.I may have many times written this but again- every time a moderate supports a taliban at any level -it is inexcusable and equal to terrorism. Hypocrisy combined with high levels of hatred are classic hallmarks of Pakistan islamic establishment. No wonder we see so many muslim youth who live in denial and refuse to see that the real problem is that the citizens of our nation are responsible for 90 percent of the nations problems instead of blaming west or India .Blaming nonstop the nonmuslim world is not going to get results anyday!!! Again one need not to see any dictionary for the meaning of hypocrisy and religious fanatism -come to the great pakistan!!! I believe Saleem is merely reporting what the Washington Post Columnist David Ignatius about Holbrooke/Mullen meeting at the US Embassy in Islamabad during their recent trip to the region. It is important to understand what motivates the Taliban if you want to deal with them. Nations maintain multiple levels of engagement. And political, defence, regional and strategic engagements are not the only ones that we should be looking at. It is in the interest of better understanding that areas where cooperation is smooth and provide clear benefits should also be given “equal treatment” in the popular media. This is needed so that media audiences can broaden their horizons. Many Pakistani and American critics conveniently ignore the fact that both countries have a long history of mutual cooperation, such as training teachers during the USAID Teacher Education Project, building the Satpara Dam in Gilgit-Baltistan and providing essential support to each other’s political and regional goals, such as ensuring security, stability and peace in Afghanistan, particularly after the scheduled withdrawal of US and Allied Forces in 2014. It appears that both countries, the United States and Pakistan, share more things in common than differences. The United States is currently assisting Pakistan in many social and institutional development initiatives from supporting legislative programs to education sector reforms. The relatively new but welcome commitment of the United States to Pakistan’s democracy, in part through the USAID Pakistan Legislative Strengthening Project, is extremely encouraging. It’s worth noting that, though Pakistan’s democracy is not new, it’s the first time in the country’s history that a democratic government is completing its term instead of a military regime. At present, Pakistan is the largest recipient of the US Educational Foundation’s Fulbright Program in the world. There are 569 Pakistani students studying in the United States at American universities of their choice. In addition, America recently contributed to upgrading the education system in Pakistan. Eight leading American universities have partnered with their Pakistani counterparts to form distance-learning programs using the internet. For example, on 3 February 2013, San Jose State University signed a Memorandum of Understanding with Allama Iqbal Open University to improve the educational methodologies for their respective students via a distance learning program. Conducting joint research, updating curricula and faculty exchange programs are just a few aspects of the program. Seven other universities have also benefited from the program. Earlier, Fatima Jinnah Women’s University, National University of Modern Languages, Quaid-e-Azam University, Shaheed Benazir Women’s University entered into joint partnership with the University of Texas, the University of North Texas, Ball State University, and Southern Methodist University respectively. These MOUs are expected to inject nearly $9 million into Pakistani universities that are now linked with their American counterparts. This exchange will also enable Americans to learn about a country that usually gets negative press, and its people. At another level, the United States is providing financial assistance to various provincial government programs that educate nearly 3.2 million children in Pakistan. America has helped 16 public universities in Pakistan to build teacher training facilities. Moreover, other educational programs provide higher education scholarships to nearly 12,000 Pakistani students. As Pakistan struggles to improve standards and quality of education, such activities improve the situation of thousands of Pakistani students.